This mint full-sized Riddell Speed stunner is loaded with green, gold and white team colors, comes from Riddell, and has the metal facemask evident. It comes black sharpie signed by only 3, but all are HOF caliber, or already Inducted Greats. 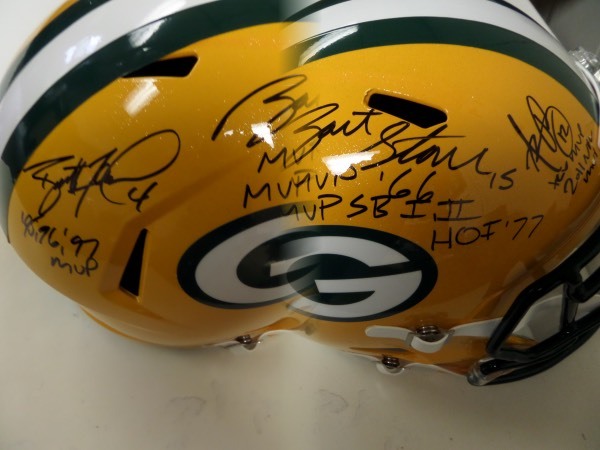 Signers are Bart Starr, Brett Favre and Aaron Rodgers, and grade all over is a clean bold 10. Solid NFL/HOF buy and hold investment, and value is well into the low thousands with AWESOME descriptions added.